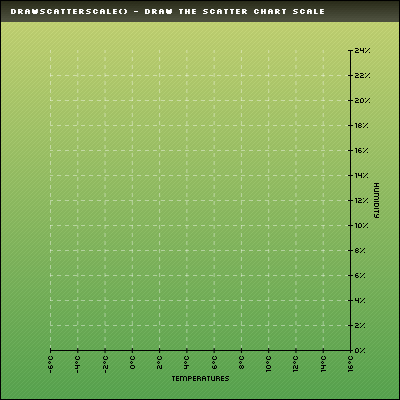 This function will compute and draw the scale of your scatter charts. It is possible to tune the rendering by playing with the $Format array. To learn more about this please read the Format array guide. This function must be called before any scatter charting functions. Format is an array containing the drawing parameters of the arrow. Customisation array - Tune up your scales! It is possible to customize the way your scale will be rendered by playing with this array. Providing a detailled configuration is not mandatory, by default the axis will be drawn black in the Left / Right mode. You can specify the rotation of the X Axis labels with LabelRotation. The minimum height of a scale div can be set using MinDivHeight. The scaling factors can be set using Factors. The X Axis margin can be set using XMargin. The Y Axis margin can be set using YMargin. The space between two scales on the same side can be set using ScaleSpacing. You can specify if you want to draw the X grid lines setting DrawXLines to TRUE or FALSE. You can specify if you want to draw the Y grid lines setting DrawYLines to ALL, NONE or to an array containing the axis IDs. You can draw dashed grid lines setting GridTicks to the width of the ticks. You can specify the grid color using GridR,GridG,GridB. You can specify the grid alpha factor using GridAlpha. You can specify the axis color using AxisR,AxisG,AxisB. You can specify the axis alpha factor using AxisAlpha. The inner ticks width can be set using InnerTickWidth. The outer ticks width can be set using OuterTickWidth. You can specify the ticks color using TickR,TickG,TickB. You can specify the ticks alpha factor using TickAlpha. If you want to draw the subticks of the Y axis set DrawSubTicks to TRUE. The inner subticks width can be set using InnerSubTickWidth. The outer subticks width can be set using OuterSubTickWidth. You can specify the subticks color using SubTickR,SubTickG,SubTickB. You can specify the subticks alpha factor using SubTickAlpha. You can specify if you want to draw the axis arrows setting DrawArrows to TRUE or FALSE. You can set the arrow size usingArrowSize. You can choose to display a 2-colors cycling background setting CycleBackground to TRUE. First background cycling color can be defined with BackgroundR1,BackgroundG1,BackgroundB1,BackgroundAlpha1. 2nd background cycling color can be defined with BackgroundR2,BackgroundG2,BackgroundB2,BackgroundAlpha2. SCALE_MODE_FLOATING for min/max automatic scaling. SCALE_MODE_START0 for fixed min to 0. 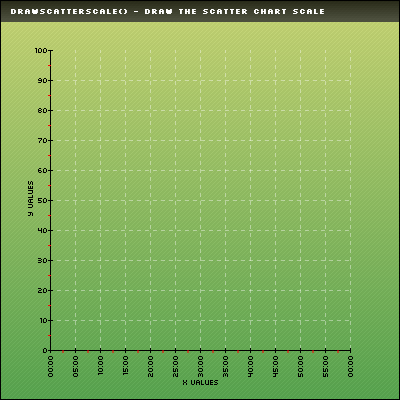 SCALE_MODE_ADDALL_START0 for stacked charts with a fixed min to 0. SCALE_MODE_MANUAL to fix manually the min & max values. You can also provide the Rows and RowHeight parameters for each axis. This function may be a bit complex to understand, you will see more example within the charting functions section. This example shows how to create two axis and set their position. This example shows how to create a manual scale providing the min and max values for the X / Y axis and the divisions settings for the X one. There is no linked topic yet. I am experiencing some problems with this function. In particular with the DrawXLines parameter. If I set FALSE, the function returns an error at line 201 of pScatter class. The function is expecting an array containing a value for each scatter series. To post a comment you must be logged. To create an account click here. Components used on this web site : Famfamfam icons has been made by Mark James, Rounded corners lite has been coded by Cameron Cooke and Tim Hutchison, SyntaxHighlighter has been written by Alex Gorbatchev. pChart and this web site have been created by Jean-Damien POGOLOTTI. This documentation contains 185 pages and 56 comments. 411 users have registered. This page has been rendered in 0,01 seconds. Wiki revision 1.37.